Nieuport with Prieur rockets on the wings. 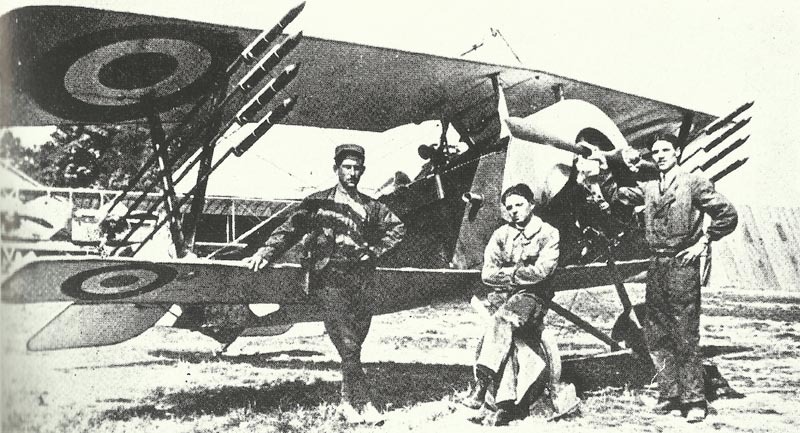 Verdun: French Nieuport 11s of Esc N65 destroy 6 kite-balloons using very short-range firework­-type rocket projectiles devised by French Navy Lieutenant Le Prieur. Western Front: 2nd Lieutenant Ball forces down 2 German aircraft, his first successes (2 more combats on May 29). Verdun: French 5th Division (Mangin) takes German trenches on 2,000-yard front Thiaumont Farm-Fort Douaumont and enters the fort after 11-minutes charge, captures most of it in 30 minutes. Artois: BEF Reserve Army (Gough) formed, becomes Fifth Army on October 30. Trentino: Austrian XVII Corps takes Bargo on river Brenta, completes advance as flank guard. East Africa: Smuts resumes advance in 3 columns through Pare and Usambara Mountains, covers 130 miles until May 31. Sudan – Battle of Beringia: Colonel Kelly’s 800 plus Egyptians and Sudanese auxiliaries (26 casualties), 8 guns and 14 MGs, which were advanced from Abaid since May 15, defeat Sultan of Darfur’s 5,000­ strong attack (over 357 casualties) 12 miles northeast of El Fasher. Kelly occupies it on May 23, takes 4 guns and 55,000 cartridges. Greece: Germany notifies Greek government that troops must enter Fort Rupel, evacuated under protest on May 27, Allies protest to Greece on May 31. Germany: Finance Minister Dr Helfferich takes Interior and Deputy Chancellor portfolios as well. War Food Office (Batocki) I created, introduces food premiums for hard workers.